Below is a picture of Roger Grable’s Zenith CH-750 stol, flying since 2015. I have a number of stories of flying builders to catch up on, particularly Zenith builders, look for these stories over the next few weeks. 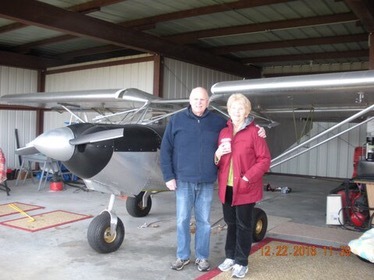 Above, Roger and his lovely wife pose with their Zenith 750, powered by a 2,850cc Corvair engine. The date on the photo is 12/22/16. The Grables came to Corvair College #22 in Texas, and they liked what they saw. After thinking it over, Roger decided to have us build his engine while he concentrated on the airframe. Roger and his grandson came to the next college, learned a lot of operational procedures, and test ran his engine: Corvair College #23 – 2850cc Engine, Roger Grable, CH-750 Builder . Life kept Roger busy, and delayed him getting his plane finished until 2015. He wisely selected an experienced Zenith pilot to cover the first tests. All went very smooth and he was very happy with progress. About the 7th test hour, Roger started the plane to taxi it across the ramp, and it ran rough, accompanied by a knocking sound. A moment later it went back to normal operation, but it was a question that remained in Roger’s mind. We spoke about it. I told him, no questions asked, drive it right over to the near by Corvair College #34 in Mexico MO, at the Zenith factory, I built it, I would get to the bottom of it, period. Roger brought the engine over the last afternoon of the College, and we formed a plan for me to take it back to Florida. Roger said he and his wife were planning a trip to my state, and would like to pick it up asap. In the back of his mind was a question about the crank, if it might have been the source of the noise. I told him we would find out. Two weeks later, Roger and his wife came to my shop, to pick up the motor. I had taken it down to every last nut and bolt and found nothing. I had the crank inspected by two different shops in Jacksonville, and no flaws were found. After listening to a very detailed account of Rogers story, I became convinced that the original Falcon heads on the motor had momentarily stuck an exhaust valve, something that had happened on another set of heads from 2012. However, I understood that the Grables confidence in their new plane was on the line, they had been good customers, and there was a simple way to make sure they returned to the feeling they had for the first hours of operation. I went down to the SPA/Panther hangar, and bought a completely new 8409 crankshaft from the Weseman’s inventory for $1,500. This was used to reassemble the Grable’s engine. The whole job, teardown, reassembly and test run took a day and a half of labor. They were very gracious, and confidence restored, they headed for home. Their total bill from me was exactly $0.00, nothing. There are just two kinds of companies in our industry, those that treat people fairly, and those that don’t. I like to say the former outnumber latter, but they don’t. The only thing I can say is that the ones that treat people fairly last. The only engine company that has been continuously active in the experimental market, under the same ownership, longer than me is Lycoming. Would you like to know why? Just ask the Grables. (Since I’m just a wanna be builder still, you can strip any of my probably too frequent under the circumstances comments from these posts and I will take no offense.) “…treat people fairly…” you say? You are ‘fair’ to the point of sacrificial…above reproach, found to be without guile. Thank you. Merry Christmas!